As black Americans explained in a new video from AJ+, racism reaches many aspects of their daily lives — not just in interactions with police that have gotten so much attention as a result of the Black Lives Matter movement, but everyday interactions between civilians, employees and employers, and business owners and customers, too. One possible explanation for these subtle shows of racism is “implicit bias”: a type of subconscious bias that can shape how people treat others, including people of different races. This phenomenon is well-documented in the empirical literature. It’s one of the key reasons cops are more likely to shoot and kill black men, and why some people act in racist ways even if they don’t see themselves as racist. As part of a study published in the American Psychological Association’s Journal of Personality and Social Psychology in March 2014, researchers studied 176 mostly white, male police officers, and tested them to see if they held an unconscious “dehumanization bias” against black people by having them match photos of people with photos of big cats or apes. Researchers found that officers commonly dehumanized black people, and those who did were most likely to be the ones who had a record of using force on black children in custody. In the same study, researchers interviewed 264 mostly white, female college students and found that they tended to perceive black children age 10 and older as “significantly less innocent” than their white counterparts. Other research suggests there can be superhumanization bias at work, as well, with white people more likely to associate paranormal or magical powers with black people than with other white people. And the more they associate magical powers with black people, the less likely they are to believe black people feel pain. 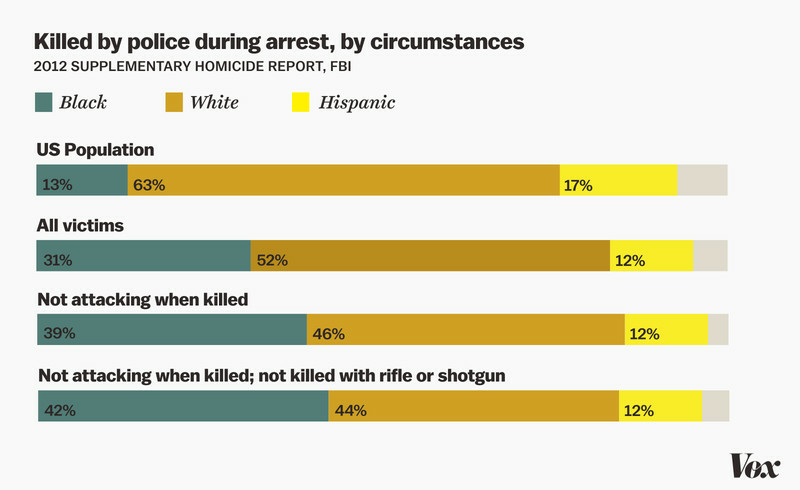 It’s this type of racial bias that has been at the center of debates over racial disparities in police use of force over the past year. When cops used force on Michael Brown in Ferguson, Missouri, and Eric Garner in New York City, the question for many critics of police was how subconscious biases factored into the deadly encounters. For instance, Darren Wilson, the former Ferguson police officer who shot and killed Brown, described the black 18-year-old to a grand jury as a demon-like, dead-eyed giant who charged at him through a hail of gunfire — a callback to old racist tropes of “giant negroes” attacking police and innocent people. Subconscious biases may explain some of the instances of racism described in Al Jazeera’s video, too. People may not think of themselves as racist, but their implicit biases may drive them to act in racist ways — even to the point that landlords will deny a perfectly qualified tenant an apartment just because of her skin color. 8 Food Secrets that Fueled Novak Djokovic’s Success ~ Eat This, Not That!